This easy teriyaki sauce and marinade tastes fantastic. Use this sauce as a marinade, stir fry sauce, or glaze for chicken, salmon or shrimp. It even keeps in the fridge for weeks! Jump to the Homemade Teriyaki Sauce Recipe or read on the see our tips for making it. If you’ve been following us for a while, you probably know that we love to make store-bought sauces and spice blends ourselves. We’ve done this with from scratch mayonnaise, homemade ketchup, ultra-creamy hummus, and even taco seasoning. This time, we’re sharing our homemade teriyaki sauce recipe inspired by our favorite teriyaki restaurants in Seattle. 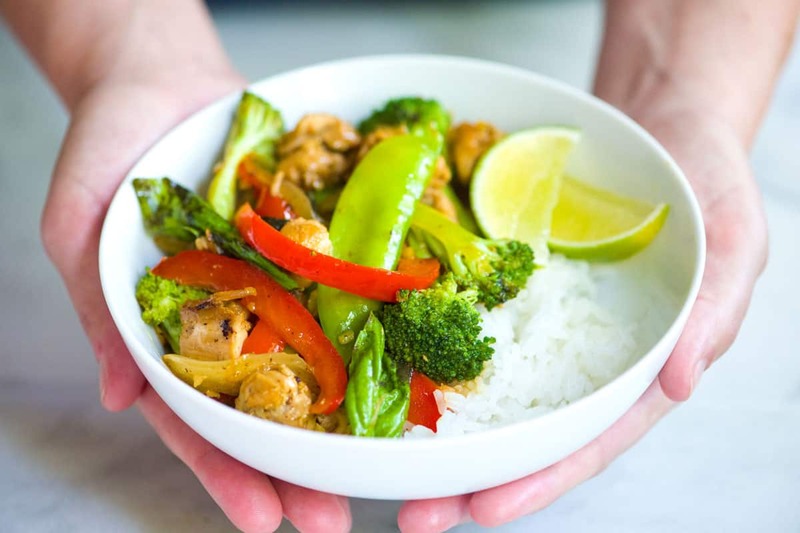 You may also enjoy our 30 Minute Ginger Chicken and Veggie Stir Fry. Use the sauce suggested in the recipe or swap for this teriyaki sauce. Both would be amazing! 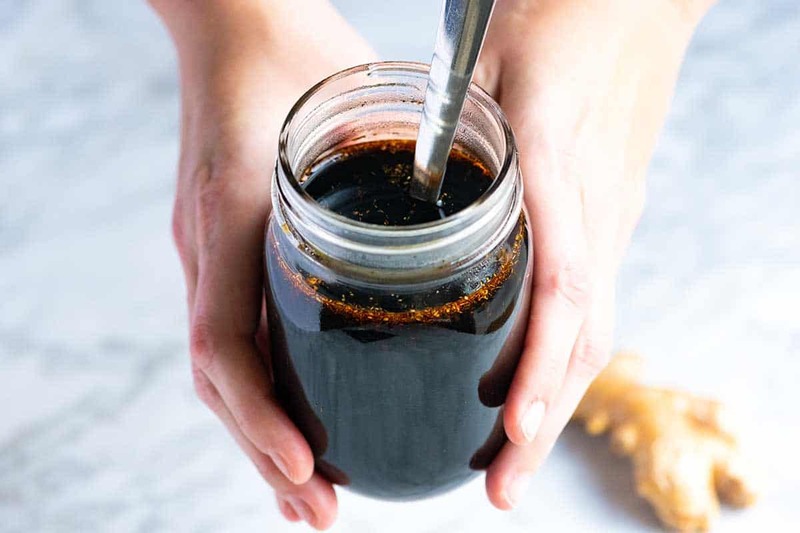 Making your own batch of teriyaki sauce is easy, and it will taste much better than anything you can find at the store. This sauce is so good; you will want a batch in the fridge at all times. With ONLY 5 ingredients, this teriyaki sauce is easy to make and tastes incredible. 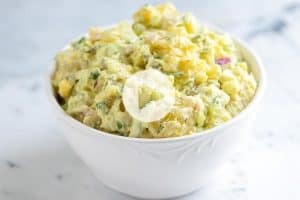 You can use it as a marinade, stir-fry sauce or glaze for meats and seafood. Think teriyaki chicken, salmon, and shrimp! The sauce keeps in the refrigerator for weeks! Make one batch today and have delicious teriyaki sauce on hand for dinner another day. You can freeze it! 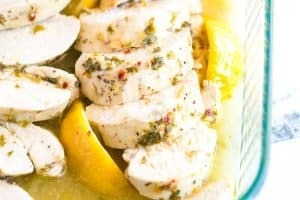 Freeze the sauce in individual servings or with meats for an easy meal down the road. 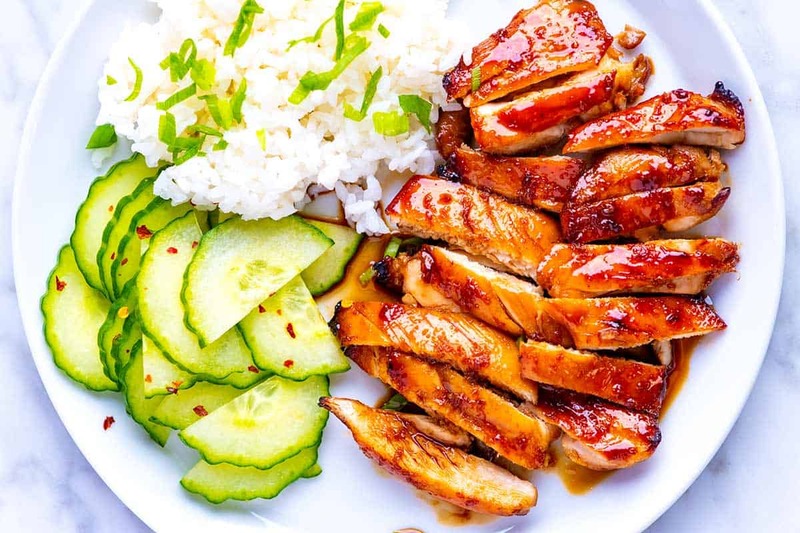 We use this easy sauce to make our Crave-Worthy Teriyaki Chicken Recipe. After marinating, we broil until the chicken is a little sticky, takes on a beautiful shine, and tastes fantastic. What ingredients do you need for teriyaki sauce? Low-Sodium (light) Soy Sauce — Soy sauce adds color, lots of flavor, and seasoning to the sauce. It’s salty and strong by itself, but when you mix it with the other ingredients, it tastes incredible. 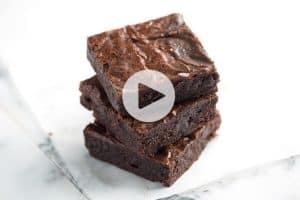 Sugar — Regular granulated sugar is all you need to make teriyaki sauce. It balances the salt from the soy sauce and helps to make the sauce sweet and glossy. Other forms of sugar work, too. Brown sugar, coconut sugar, and even honey will work. Swapping for other forms of sugar will affect the taste of the sauce slightly and can taste sweeter (even when you are using the same amount). As an example, we recently made this sauce with honey and found it much sweeter than when we make it with regular sugar. This isn’t necessarily a bad thing, just something to keep in mind when substituting other ingredients. Sake — We don’t cook too much with sake (Japanese rice wine), but we love it when making homemade teriyaki. You don’t need to break the bank when buying sake for this. Treat it the same as when using wine in cooking. Use something you’d drink, but not something you’d save for a special night. If you cannot find sake, there are some alternatives. Mirin is a sweeter version of sake. You can either swap it for the sake and leave the sugar amount as is or pull back on the amount of sugar slightly to accommodate the extra sweetness. Dry vermouth or dry sherry also work as a substitute. 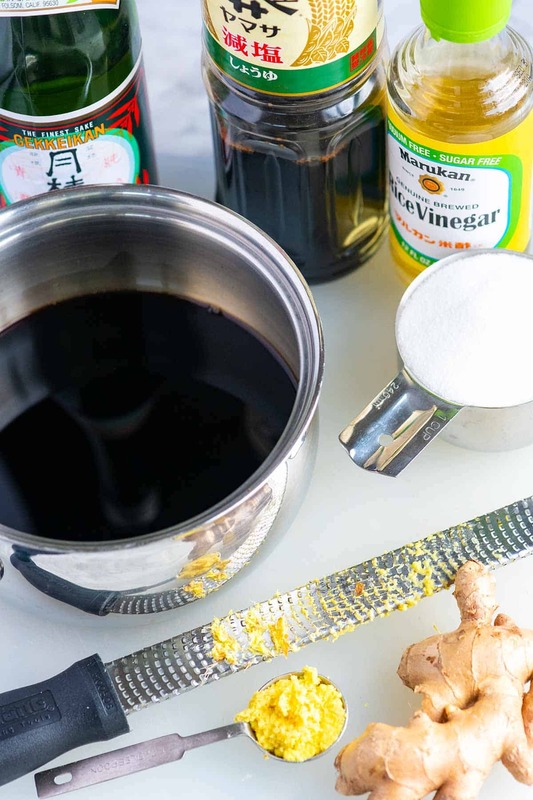 Rice Vinegar — The sauce tastes pretty good with just soy sauce, sugar, and sake, but when you add some acid from rice vinegar, the sauce comes to life. Rice vinegar is sold near other kinds of vinegar, but if you cannot find it, try cider vinegar or white wine vinegar as a substitute. When tasting the sauce after adding the vinegar, it might taste a little strong. Don’t worry! The flavors will mellow as the sauce cooks. Ginger — Fresh ginger isn’t 100% necessary for the sauce, but it does add a whole new level. We use a Microplane rasp grater to finely grate the ginger so that it “melts” into the sauce. Making teriyaki sauce is easy. Combine all the ingredients in a saucepan, and then heat them over medium heat until the sugar dissolves. From there, you can cool and store it in the fridge or for a thick and glossy sauce, simmer for an extra 5 to 10 minutes. Easy! 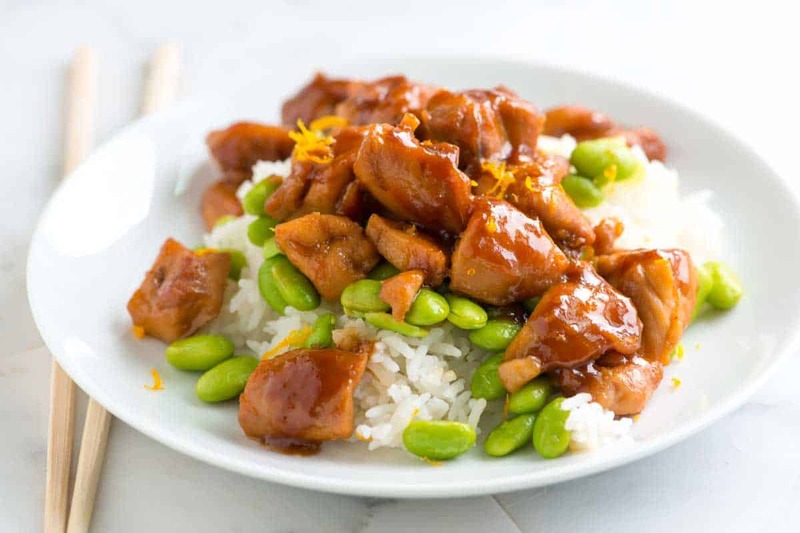 For another variation of teriyaki, take a look at our Orange Ginger Teriyaki Chicken. In this recipe, we swap sugar for orange juice and honey. Use this teriyaki sauce as a marinade, stir fry sauce, or glaze for chicken, salmon or shrimp. We use sake to make teriyaki sauce (it tastes so good). If you don’t have sake, we have provided alternatives in the notes section below. Combine ingredients in a saucepan over medium heat and cook, while stirring, until the sugar dissolves. Or, for a thick and shiny sauce, bring the teriyaki sauce to a simmer and cook for an extra 5 to 10 minutes. Cool. Store the sauce in the refrigerator for several weeks. You can also freeze the sauce up to 3 months. If it ever seems too thick, thin with a tablespoon or so of water. For the ginger, we use a Microplane rasp grater, which helps the ginger to “melt” into the sauce. You can finely mince, but you will be left with bits of ginger in the sauce. Substitute for Sake: We love the delicate flavor of sake for teriyaki sauce, but if you cannot find it there are some alternatives. Mirin is a sweeter version of sake. 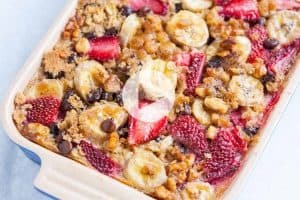 You can either swap it for the sake and leave the sugar amount as is or pull back on the amount of sugar slightly to accommodate the extra sweetness (Try 3/4 cups of sugar instead of 1 cup). Dry vermouth or dry sherry can also work as a substitute. 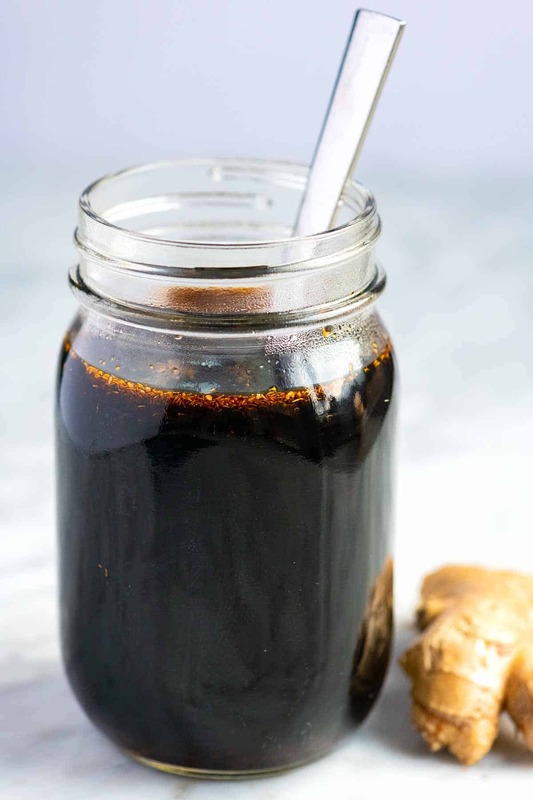 Can I Reduce the Sugar: The 1:1 ratio of sugar to soy sauce makes a nicely balanced sauce that is similar to most teriyaki restaurants and bottled sauces. It’s delicious, but if you are concerned with the amount of sugar, you can get away with reducing it. Reducing the sugar from 1 cup to 3/4 cup or even 1/2 cup will make tasty sauces. Since the sauce does not need to cook long, you can taste as you go. Start with 1/2 cup, taste, and then increase the sugar until you are happy with the balance of salt and sweet. Using cornstarch: We do not include cornstarch in our recipe. Some teriyaki sauce recipes call for a little cornstarch mixed with water added to the saucepan to thicken the sauce. We find that an extra few minutes of simmering thicken the sauce enough for us, but you certainly can include it if you prefer.